The Roar and Snore sleepover at the San Diego Zoo Safari Park gave my daughter and me an exciting and easy way to try camping. I had been toying with the idea of escaping suburban life for a camping getaway to reconnect with nature but I was daunted by the prospect. 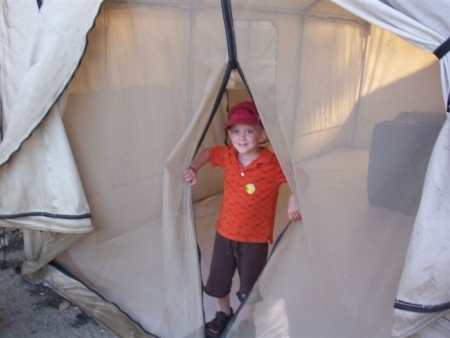 This program seemed like a manageable and unique way to experience camping with a child. No matter your motivation, here’s what to expect from a Roar and Snore adventure at the San Diego Zoo Safari Park. As members, my family has spent a tremendous amount of time at both the San Diego Zoo Safari Park and its sister location, the San Diego Zoo. The camping tents on a hill near the lions at the Safari Park piqued my curiosity during one visit. I learned that the tents house Roar and Snore sleepovers. Further research revealed that Rore and Snore participants are outfitted with a pre-assembled tent, sleeping pads, and camp chairs. Pricing includes all snacks, meals, activities, and crafts. 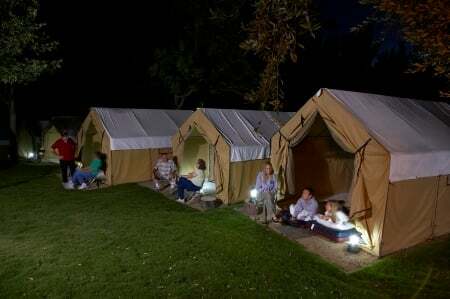 For an extra charge beds, wood floors, and electricity are available in the fancier Premium tents. But that seemed too posh to count as camping to me. I suggested attending a Roar and Snore to my 4-year-old, Karissa. She was familiar with the idea of camping from bedtime stories like Curious George Goes Camping and Just Me and My Dad. With my daughter’s enthusiastic approval, I signed up! Since I was leaving my husband and baby boy at home, I invited my friend, Vessa, and her son, Tanner (age 4), to join us. The four of us checked-in during the late afternoon. We made our way to our assigned tents to explore our temporary digs. Each family got its own tent cabin, which slept up to four. Karissa and I had plenty of room to spread out, with our friends housed just next door. We unrolled our sleeping bags (purchased especially for this excursion) and donned the blue Roar and Snore t-shirts provided as part of the package. Due to our late start, we had to rush a bit to attend the first of several animal encounters. A zoo employee brought out animals, like a great horned owl and a spring haas (a rodent that looks like a cross between a rabbit and a kangaroo). Then she discussed it at length before allowing everyone to get an up-close look and maybe even pet it. At dinnertime, we were served a buffet of hot dogs, chicken, hamburgers, veggie burgers, macaroni and cheese, baked beans, and an ice berg lettuce salad. To drink there was a choice of fruit punch or water. Afterwards, it was time for a craft activity. Kids received paper grocery bags cut into wearable vests to decorate with colorful paints. While the creations were hung to dry, the children ran wild, self-directing themselves to crawl, hop, and growl like animals. Next, zoo employees led small groups on walking tours. 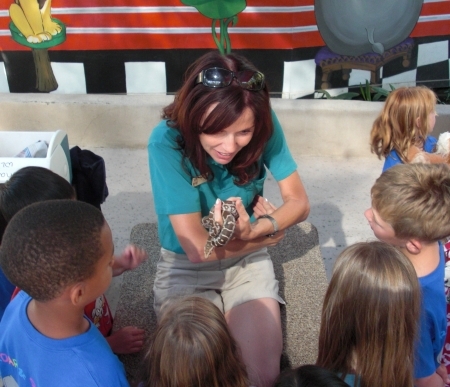 They gave campers a behind-the-scenes peek at animals like tigers, elephants, cheetahs, and lions. After the animal walks, we reassembled to enjoy s’mores, popcorn, and hot cocoa or coffee. There were also grown-up beverages available for purchase. Vessa and I each enjoyed a cup of wine to take the edge off the whining that surrounded us. Most of the children were in the midst of major meltdowns by now because it was already later than 8 pm, past most of their bedtimes. When the sun descended, it was campfire time. From the jubilant looks of it, this was the highlight of the event for most of the kids! The children donned their painted paper vests and paraded around a giant fire pit. Zoo workers stood guard around the fire for safety’s sake. Upbeat music played while the children were instructed to act like monkeys, elephants, snakes and more. They hopped, slithered, tooted, and growled in joyous, cacophonous circles. Finally, it was bedtime. We got into our jammies and lined up to use the group bathrooms to get ready for bed. Showers were available and some folks even used those. Toys, besides a favorite lovey, were not allowed but we did bring some children’s books to read. Karissa and Tanner took turns traipsing back and forth between the tents to say goodnight over and again. An orchestra of chirping crickets and croaking frogs lulled Karissa and me to sleep around 10:30 pm – after very long night for a little kid (and her mama!). Around 4 am, we woke to the loopy calls of crazy birds. Karissa complained that it was too loud, but I convinced her to sleep some more. It felt like we were at the center of a rock concert performed by nature’s creatures. Some participants with tents closest to the lions’ enclosure said they heard the sounds of lions roaring as the sun came up. Alas, we did not. The first official wake-up call sounded at 6 am and breakfast was served an hour later. The breakfast buffet consisted of pancakes, sausages (and veggie sausages), scrambled eggs, and various breakfast beverages. Beware that coffee was served from the same large container as was fruit punch the night before. My daughter thought she was getting a cup of punch but instead burned her fingers with hot coffee. After breakfast, we took part in more animal encounters and went on more walks to learn about animals. The San Diego Zoo Safari Park staff went of their way to make sure we all got our money’s worth, but it proved to be too much for the kids in our party. After such a late night the evening prior, both Karissa and Tanner splayed out during one of the presentations and dozed off. Did it satisfy my camping craving? Somewhat. Everyone enjoyed seeing the animals up-close and learning from the expert zookeepers, but I was seeking to connect with nature and with my daughter. Therefore, the high points of the sleepover for me were quiet moments away from all of the program’s activities, like pointing out the sparkling stars in the fiercely black sky to Karissa, and lying side-by-side in the tent with her as we listened to the rowdy sounds of nature’s nighttime chorus. Would I recommend the San Diego Zoo Safari Park’s Roar and Snore to other families? Absolutely! You and your children will always remember this one-of-a-kind experience. A year later, Karissa still talks about her “camping trip” with her mama. Whenever we go the Safari Park she asks if we can sleep in the tents again, this time with her daddy and brother, Leo, too. I tell her yes; just not until Leo is at least age 6. Although children of all ages (including babies) can attend, I suggest attending with older children who have the attention span and stamina for the jam-packed schedule. 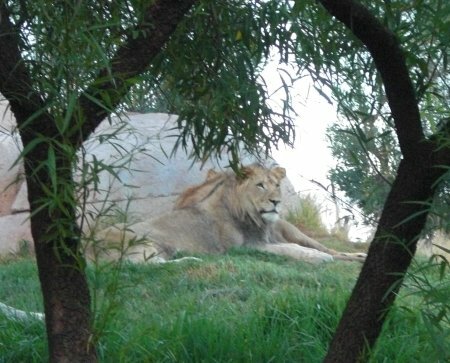 Do you have any questions, tips, or stories about the San Diego Safari Park’s Roar and Snore sleepovers? Let us know in the comments below! Sounds like a great experience for non-camper. Too bad we live on the other side of the coast. 🙂 There is similar program at our Atlanta Zoo but I think Wild Animal Park is bigger and probably provide more up-close to the animal at behind the scene tour. 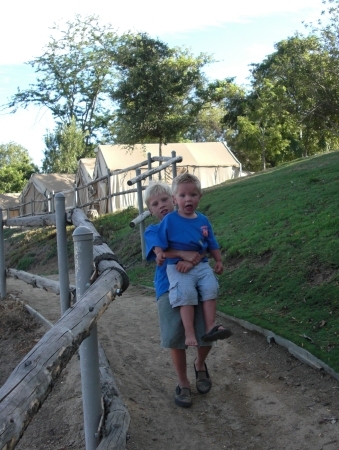 Tanner still asks if we can go on another sleepover at the Wild Animal Park! Our family once went “camping” through a Michigan YMCA. It was springtime and we slept in uninsulated cabins. The night became so cold that my two-year-old slept on my chest, in order for the two of us to keep warm while my daughter and husband slept peacefully in separate beds. I must say this really is the fourth time I’ve read your website and Im likein it! I added your weblog to my rss reader. Hoping to see more posts! How fun! I would love to do this with my niece and nephew, who are visiting in March. What a nice way to spend some special time with special kids in your life! We are going but flying from Chicago. Do we rent, buy or borrow sleeping bags. Any suggestions to save a buck because this experience comes with a price. 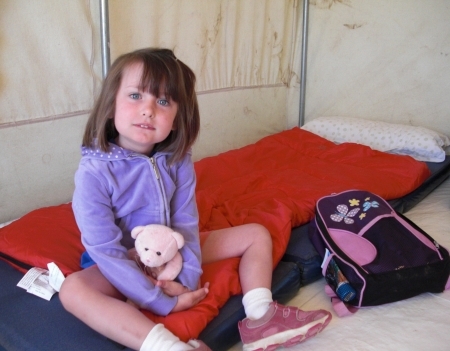 Cece – You need to bring your own sleeping bags and pillows unless you choose the “Premium” accommodations. Given baggage fees, it might be worth it to go for the upgraded tent! Enjoy! Hi Linda, you can click the Roar & Snore link at the top of this post to see a schedule of the next camp-outs at the park. I give details of what is included and what to expect in the story above. Have fun! Thank you for your description of what goes on. After I read a different person’s review, I was nervous. After yours, I’m excited! I hope my experience matches yours. Tracey – I hope you have a wonderful time at the Roar & Snore! Let us know how the experience goes for you! This was very helpful as we are bringing our 9 year old daughter and neither of us have ever camped out but we practice at home in DIY tents in her room. I’m guessing no private toilets even in the premium tent… She’s an animal lover and we are traveling from CT to do a west coast trip. Any suggestions for Seattle, Sacramento and Lake Tahoe would be very welcome as you certainly seem to know your stuff! Thank you. Does anyone know if there are adults only nights? Are there any showers and are they public or private? Is there a fee or anything you know of for bringing a lot of pillows? I know park admission need to be purchased but if we want to go to the park the day we stay the night, do we have park access the day we wake up or do you need to leave after? Thank you with any help you have. Hi Jess- What a great anniversary surprise! There are showers available. They are public but with stalls for privacy. Admission to the park is included with your Roar and Snore purchase. You will have access to the park and I believe you can stay as long as you like. There’s no extra charge for bringing your own pillows. Enjoy!